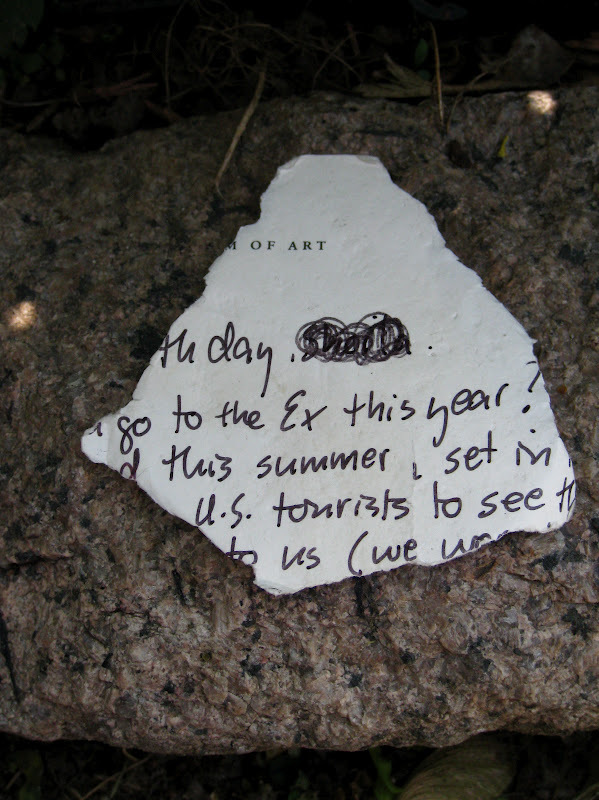 story inspired by a ripped scrap of paper I found on the ground. I notice things that other people don't see. Details. In front of me is a man with three white hairs jutting from his left nostril. His stomach is straining against the fabric of his checkered shirt and I can see the buttons wanting to pop. On his feet are scuffed orthopedic sneakers. "You are 56 years old," I say into my microphone, "And 253 pounds." The man's face flushes and his wife claps her hands. I hear laughter and cries of amazement from the crowd. "How does he do it?" they say about me. "He's right every time." I'm Win, of "Winston's Weight and Age Guessing." I've got a booth at the Toronto Exhibition Place. I'm especially popular with the U.S. tourists. And they're right, I've never been wrong. But then she walked up. She wore yellow cotton shorts and a shirt with birds in flight printed on it. Sunglasses on top of her head held back her curly chestnut colored hair. "Let's see what you've got," she said, passing me a folded twenty and stepping onto my platform. First, I circled her. I swear she smelled like soap and green grapes. There was a birthmark on the back of her bare calf the shape of a thumbprint. I felt a trickle of sweat run from between my shoulder blades all the way down my spine. She had freckles on her nose that made me want to shout with delight. "This is the woman who will undo me," I thought. I've never done this before but I reached up and lay my palm against her blouse. She moved back, surprised. I let my hand drop, but not before delighting in the curve of her waist. I raised my microphone and I swear my hand was shaking. "You are 28 years old and 122 pounds," I stammered. Everyone laughed and clapped, and I passed her back her twenty dollars. Then she slipped away from me, into the crowd.